The bathtubs in the hallway are here to stay. One for every bedroom where the tenants used to pay. 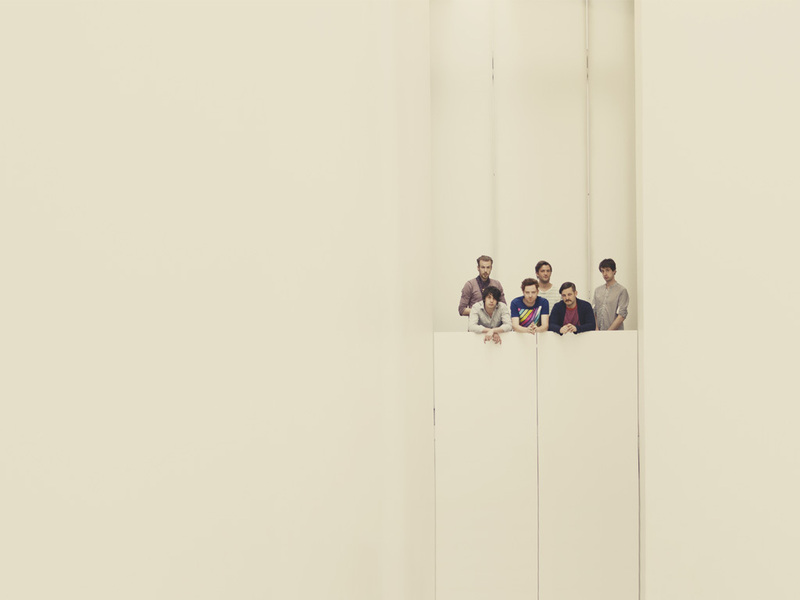 A six-piece ensemble from Winnipeg, Manitoba, Royal Canoe give you everything, but on their own maniacally hybrid terms. It's one thing to reference a particular style, or even a range of styles. It's another thing entirely to grab huge handfuls of sounds from pretty much anywhere, throw them all together and come up with something both cohesive and totally distinctive—something that also happens to ripple and crack with energy. This is what Royal Canoe does best. As a listener it all feels effortless but as is usually the case, the easier it feels the more work it takes. Royal Canoe's dedication to crafting a seamless musical pastiche is obsessive. For live shows, they’d rather lug hundreds of pounds of keyboards, mixers and pedals across the continent (very much like a voyager canoe, in fact) than rely on lengthy backing tracks. They actually play every part, every time. And while their van is packed with hardware, much of that hardware is, in turn, crammed full of widely-sourced samples and adoringly homemade sounds. Their fearlessness about grabbing and using whatever they feel like is grounded in decisive confidence, not recklessness. In 2012 alone, Royal Canoe released two independent EPs, Extended Play and Purple & Gold. They took part in Winnipeg Symphony Orchestra's New Music Festival, arranging and performing a portion of Beck's Song Reader, an album released as sheet music and published by McSweeny's. They brought so much musical goodness to CMJ that they landed on Best Of lists of The New York Times, KCRW and Consequence of Sound. And they played nearly one hundred shows. For 2013, the main act (so far) is releasing their first full length album, Today We're Believers, with L.A.’s Roll Call Records and Toronto's Nevado Records. They have cited their hometown as a core influence for their work, in particular, Winnipeg’s extreme perpetual cycle through euphoric summers under gigantic prairie skies, to near-debilitating winters that instill their own intense, almost aggressive energy into the psyche. While the 2012 EPs feel more consistently located in hot open spaces, more about floating in strangers’ backyard pools without them knowing and biking all sweaty down roads that don’t actually end, Today We’re Believers leans more heavily into urban side of things, cruising the downtown core at night with streetlights blurred by frost patterns on the windows. The full cycle is balanced out. If you really, absolutely had to reduce Royal Canoe to a single ‘thing’ you could say they catch the moment of explosive, blissful restlessness that hits you when a savage winter finally eases into light, and you feel some actual warmth on those pasty, vitamin-D deprived limbs and all they want to do, suddenly, is move.